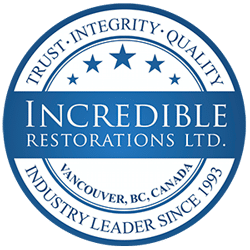 At Incredible Restorations, we work with a few selected flooring companies across the lower mainland. It’s very important for us to work with flooring contractors that represent quality, professionalism, and high customer service standards. Our flooring installers understand that they represent the brand Incredible Restorations, setting the correct expectations to the client while managing the project with care and professionalism. We will find the exact or comparable flooring materials used prior water loss condition. Our flooring companies carry, supply, and install a variety of wood flooring across Vancouver and Fraser Valley such as solid hardwood flooring, engineered hardwood flooring, and exotic hardwood flooring. Selection include a large variety of wood flooring widths, colours, and wood species such as oak, pine, walnut, cherry, birch, and bamboo flooring. It’s all about quality workmanship and professionalism. Our selected contractors provide quality tile installation in bathrooms, kitchens, common hallways etc.. for any residential or commercial property. We work with flooring contractors that match the type and the quality of the materials before the property suffered a water or fire damage. Incredible Restorations works with the best tile installer in Vancouver. Our flooring contractors carry, supply, and install a variety of tile flooring in including ceramic tile flooring, porcelain tile flooring, mosaic tile flooring, and vinyl tile flooring. Our selection includes a large variety of tile flooring sizes, textures, colours, and styles. In the event of a black water flood in a residential or commercial property, the affected carpet MUST be removed and disposed of preventing further damage to other building materials and possible health risks to the occupants. After removing the contaminated carpet and applying antimicrobial solution, the concrete flooring and surrounding materials including baseboards, drywall, and insulation must be completely dried down. A new carpet is installed matching the quality and material standards bringing your home back to pre-loss condition. Our carpet contractors are the highest quality installers in the lower mainland, and understand the importance of professionalism and customer service. At Incredible Restorations we guarantee the workmanship for 1 year, and carpet materials to manufacturer’s warranties. Our flooring contractors offer a great selection of carpet flooring options for both residential and commercial properties. You may choose carpet flooring for the versatility, comfort, and style that carpet delivers.